The exciting 6-month-old Effervescence Champagne Bar and eatery continues to create a vibe in the city among newbies, regulars, visitors, locals, celebrities, neighbors, industry folks, etc. Guests just can’t get enough of it! Thanks to owner, Crystal Coco Hinds, Effervescence also has a super set of chefs; Co-Executive Chef Brenna Sanders and Co-Executive Chef Evan Ingram head the establishment’s culinary program. 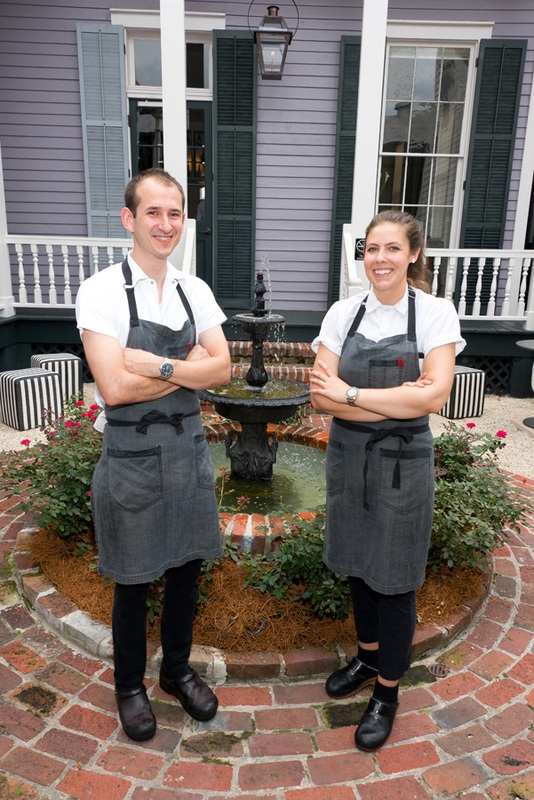 The duo met in New Orleans, each pursuing culinary careers. Both worked at the greatly acclaimed Restaurant August, where they established their foundation in fine dining. Evan, a California native, and Brenna, from Alabama, sought to expand their culinary repertoire, moving to San Francisco to work in such highly regarded restaurants as Quince, Rich Table, and Saison. In California, they adopted a rigorous uncompromising approach to product and quality ingredients in Michelin-rated kitchens. But they missed the culture and climate of New Orleans, which drew them back and returned in search of a kitchen where they could jointly create something new. After a stint with their own pop-up, l’Américaine, the couple’s love of bubbles led Brenna and Evan to Effervescence. In the small but well equipped kitchen, they curate a focused menu that is fully produced in house. “We are thrilled to have so many guests coming to Effervescence for a dinner experience,” said Brenna. Brenna continued, “We bake our own bread. We said when we started if it became unfeasible we would buy bread from a local bakery. So far, we are baking a lot more than we expected and are keeping up just fine. We do use some of Bellegarde’s fantastic organic, freshly milled whole-wheat flour in the bread we make at Effervescence. Fresh flour has so much flavor,” she added. The chefs stay loyal to the food they like to prepare and enjoy: bright, fresh, and flavorful dishes without forsaking health and wholesomeness. “We both really love the plateau,” said Evan. “It is essentially 5 small dishes so we can really show off a lot of what we do in one dish as well as the wonderful fruits of the Gulf. Brenna added that their favorite thing about their vegetable dishes is bringing together healthy ingredients with indulgent and luxurious components.